A Fuse (1A), speaker jack, and vibrato jack are located on the bottom of the chassis. Fender switched back to the blackface era cosmetics in 1982. Vibro Champs produced in 1982 have a black control panel and silver sparkle grill cloth. I have a 1978 silverface VC with an after market cover. Jenson P8R speaker and all JJ Electronic tubes. I still have the original RCA 5Y3 rectifier tube. I decided to get a new one when I blew out a fuse not long ago. This is a great small amp. I have an 1978 silverface vibro champ and i want to replace the capacitor do you have a kit for that? 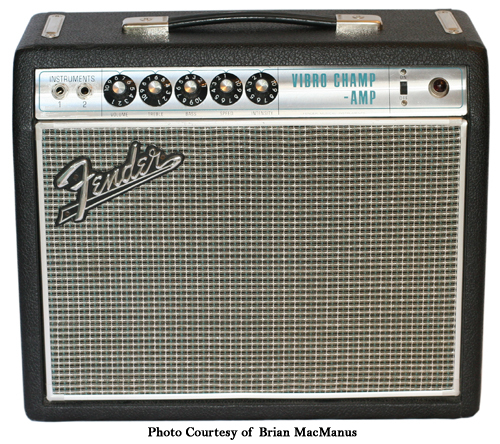 Have an chance to pickup a 1974-1976 vibro champ for 300.00. Does this seem like a good pick up? @ Rich…..excellent deal. Go for it if you haven’t done so already. Hi there, couple of questions. I just purchased a one owner (estate sale) 1973 vibro champ all original with the exception of a recent service where it was tuned, and the 3-prong power cord upgraded and soldered. The pots/contacts were cleaned and refreshed. Power caps refreshed @ 5 days 400vdc, 100k drop. The power tube cathode cap was replaced. Can you explain the power cap information and what is a 100k drop? Also, I have read on line that the early 70’s SF champs still had the BF chassis is this true of the early SF VC? If so how can I check mine? One last thing: can you recommend a awesome replacement Alnico speaker? I paid $465 I think I got a good deal. Thoughts? In regards to a replacement speaker, I recommend the Jensen Alnico P8R. I’ve tried several speakers in my SF VC, and this one was by far the best fit. As for the chassis, I believe the BF and SF are infact the same. Unlike most other Fender combos, the VC did not undergo any changes during the BF/SF transition, except cosmetics. The circuits are identical, and I’d be shocked if the chassis is different. The other questions are way out of my leauge, I’m not a technical guy, just a player who loves great tone! Have a Silverface Vibro Champ, need reparation, anyone have schematics for this one ?